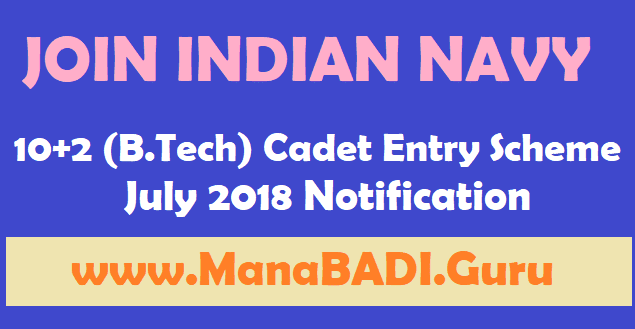 Indian Navy 10+2 (B.Tech) Cadet Entry Scheme July 2018 Notification, Online Application, Indian Navy invites Applications from UNMARRIED MALE CANDIDATES (fulfilling the conditions of nationality as laid down by the Govt. of India) to join the prestigious Indian Naval Academy, Ezhimala, Kerala for a four year degree course under the 10+2 (B.Tech) Cadet Entry Scheme. Candidates who have appeared for JEE (Main) 2017 exam. Call up for Service Selection Board (SSB) will be issued on basis of JEE (Main) 2017 All India Rank. All Eligible and Interested candidates can apply online on or before 30-11-2017.In this post given detailed information about Indian Navy 10+2 (B.Tech) Cadet Entry Scheme (Permanent Commission) Course commencing July-2018. Born between 02 Jan 1999 and 01 Jul 2001 (both dates inclusive). Candidates who have appeared for JEE (Main) 2017 exam. Call up for Service Selection Board (SSB) will be issued on basis of JEE (Main) 2017 All India Rank. The minimum acceptable vision standards for distant vision is 6/6, 6/9 correctable to 6/6, 6/6 with glasses. Should not be colour/night blind. *IHQ of MoD reserves the right to fix cut off for shortlisting the application for SSB based on JEE (Main) All India Rank- 2017. No communication will be entertained on this account. *SSB interviews for short listed candidates will be scheduled at Bangalore / Bhopal / Coimbatore / Visakhapatnam from Feb - Apr 18.
through SMS as provided by candidate in their application form. *SSB interview will be conducted in two Stages. Stage I test consists of Intelligence test, Picture Perception test and Group Discussion. Candidates who fail to qualify in Stage I will be routed back on the same day. Stage II test comprises Psychological testing, Group testing and Interview which will last for 04 days. Successful candidates will thereafter undergo Medical Examination (approx duration 03-05 days). *Change of SSB venue for interview is not permissible. *A choice of date for appearing in SSB will be indicated in the application dashboard for shortlisted candidates. Any correspondence regarding change of SSB date is to be addressed to the Call up Officer of the concerned SSB. Award of fresh dates for SSB would be subject to availability off batches/slots. *No compensation will be paid in respect of any injury sustained as a result of tests. Commission on production of tickets. Candidates will carry photo copy of the first page of bank passbook or cheque leaf where the name, account No. and IFS Code details are mentioned while appearing for SSB. #The training is scheduled to commence in Jul 2018. #Candidates recommended by the SSBs and declared medically fit, will be selected for training in Indian Naval Academy Ezhimala, Kerala based on All India Merit and on the number of vacancies. All India Merit will be prepared as per SSB marks. Selected Candidates will be inducted as Cadets for four year B. Tech course in applied Electronics & Communication Engineering (for Executive Branch), Mechanical Engineering (for Engineering Branch including Naval Architect specialisation) or Electronics & Communication Engineering (for Electrical Branch) as per Naval requirements. On completion of the course, B. Tech Degree will be awarded by Jawaharlal Nehru University (JNU). Note:- The entire cost of training, including books and reading material, will be borne by the Indian Navy. The cadets will also be provided with free clothing and messing. Candidates are to register and fill application on the recruitment website www.joinindiannavy.gov.in. The candidates are to apply from 11 Nov 17 to 30 Nov 17. Whilst filling up the e-application, it is advisable to keep the relevant documents readily available to enable correct filling up of personal particulars. (a) Details are to be filled up as given in the Matriculation Certificate/12th certificate. (b) Fields such as e-mail address, mobile number are mandatory fields. 10th marksheet, 12th marksheet, JEE (Main ) 2017 scorecard (indicating All India Rank) and a recent size colour photograph should be scanned and uploaded in PDF form. (d) If any scanned document is not legible/ readable for any reason, the application will be rejected. (e) Print one copy of online application form and carry it along with original certificates/documents as mentioned in para 23 note (c) while appearing for SSB interview. (a) Please read the instructions given on the website carefully before finally submitting your online application. (b) Your application is subject to subsequent scrutiny and the application can be rejected, if found INELIGIBLE/INVALID at any point of time. (c) After closing of online application, no request will be entertained for amendment in uploaded documents.